TV with Thinus: M-Net working on expanded plan for 8th season of Game of Thrones, as paranoid HBO instructs M-Net to again beef up content security standards before the final season starts. 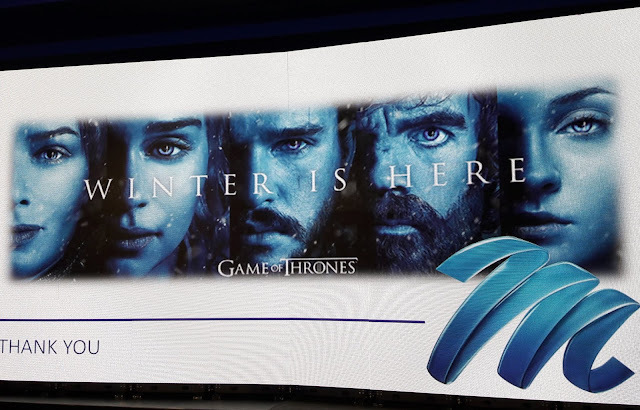 M-Net working on expanded plan for 8th season of Game of Thrones, as paranoid HBO instructs M-Net to again beef up content security standards before the final season starts. As M-Net (DStv 101) gets ready for Winter to come, the channel is expanding its plans for the spectacular upcoming 8th season of Game of Thrones starting in mid-April, as HBO in America meanwhile ordered M-Net to again beef up and further improve its existing content and IT protection systems even more to protect and safeguard the show. As TVwithThinus already revealed earlier this month, M-Net will again have the 8th season of Game of Thrones as an Express from the US title. It means that M-Net will simulcast and show new episodes of the hugely buzzed-about final season of Game of Thrones to DStv subscribers in South Africa and across Africa at 03:00 in the mornings at the same time as it's broadcast in the United States, starting from very early on Monday morning 15 April with the first episode. M-Net will then also show the week's new Game of Thrones episode during prime time although the channel has not yet announced the day of the week and timeslot that it would be in. "I can't contain myself. It's really outstanding - the things that we've seen so far I can't believe. I can't share but I cannot believe, said Tracy-Ann van Rooyen, M-Net's head of scheduling and programming. She spoke and led a press panel session about M-Net's international content at M-Net's comprehensive 3-day programming upfront that took place last week at Gold Reef City in Johannesburg where M-Net discussed and answered questions about Game of Thrones. Meanwhile HBO is so paranoid about possible content leaks, spoilers and content theft that could potentially happen through its international broadcast partners, that HBO - according to sources who spoke directly from first-hand knowledge - instructed M-Net for a second time to yet again beef up further and implement additional digital content protection safety measures and IT protocols. It follows disastrous mistakes like when pay-TV operator Star India leaked the 4th episode of the 7th season when 4 workers breached its data management system and saw the episode go viral globally. That was followed by HBO Spain and HBO Nordic territories just a few weeks later in August 2017 that accidentally leaked the full-high definition penultimate episode of the 7th season of Game of Thrones days before its supposed broadcast date that also saw that episode instantly go global. A while ago HBO asked to audit M-Net's broadcast facilities and to approve the pay-TV broadcaster's security standard operating procedures (SOP). These new, upgraded security standards regarding content management, storage and playout have been in place specifically for Game of Thrones and all of the other HBO shows that M-Net broadcasts as Express from the US. "Two weeks ago M-Net got a 40-pager - I kid you not - from HBO to improve on those, and to change those for the final season of Game of Thrones because they are so paranoid that there are absolutely no leaks," said a source. "It's fascinating."